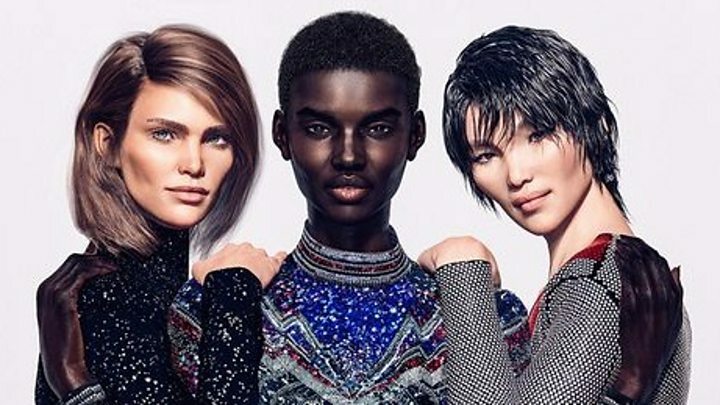 These three models are the faces of Balmain's new campaign. They have the perfect angular cheekbones and ooze glamour most could never manage. But Shudu, Margot and Zhi don't exist. They're the latest in a line of computer-generated models being used in advertising. Balmain worked with British photographer Cameron James-Wilson, who created digital supermodel Shudu last year. Shudu has now gone from having her Instagram featured by Rihanna's make-up brand Fenty Beauty to being at the centre of a major fashion campaign - all without existing in real life. But what does this mean for real models? Louise Stone is a model from London who's worked on campaigns with L'Oreal and Adidas. The 24-year-old is worried this new wave of CGI models could make an already competitive industry more difficult to navigate. "It's just so easy to be replaceable," she told Radio 1 Newsbeat. "To have to compete with literally unreal girls is just really scary - you can shape anything you want and have the exact perfect look without the casting process." A big criticism of Shudu has been that the black CGI model is taking up space which could be filled by a real black model. "Lots of these CGI models are actually based on women of colour," said Louise. "Models in general have it hard enough with how competitive the industry is - models of colour have an extra point to prove and have to work harder." Dominique Robinson landed a campaign with Tyra Banks after the supermodel commented on one of her Instagram photos. She said she was "in shock" when she first saw the Balmain campaign. She thinks models need to talk about what it could mean for their careers. "Girls work their entire career hoping to book a Balmain campaign, or any campaign really," she said. "If it's just that easy to hand a campaign to CGI models… what does the future of e-commerce look like for us? "And it's not only cutting models out, it's cutting out production too." It's not just models who are concerned. Photographer Manny Roman was among those posting criticism on Balmain's Instagram. He's concerned about the impact seeing the models could have on self-esteem. "While I do admire the campaign's digital art, I don't like the non-realistic message that Balmain is sending out to society," he said. "Many of us are consumed with our social media accounts and some have a hard time living up to the physical standards of models and celebrities they follow. "I fear the CGI models image will escalate the body and image dysmorphic epidemic." Boosted by huge Instagram followings, CGI models have become more and more popular. Before he worked on the Balmain campaign, Cameron James-Wilson's model Shudu became popular because, initially, people weren't sure whether she was real or CGI after her posts began getting attention on Instagram. "The interest has literally been overwhelming," he said. "I love every second of developing these new characters. "How many people get to make a supermodel as their day job?" Since the Balmain campaign came out, he's been approached by other brands to possibly create avatars for them - but he doesn't think real models need to worry. "I see digital models as something that is very situational and works well for certain things but not so for others. "Both can coexist and also work together." He added: "Imagine if a real model was scanned digitally and then could work anywhere in the world at anytime and do multiple shoots a day?" Cameron says he's not averse to criticism - he calls it an "important factor" in his work. But he also doesn't see the controversy around his models as any different to controversies around new tech in the past. "With any new technology there's always a polarised discussion - some people are staunchly against it, and some people embrace it."